‘We are going on a Segway tour in Granada!’ I announce to the ladies of Wyld Family Travel. This was met with excitement, apprehension and fear. Funnily enough, the excitement came for our 8-year-old, the apprehension from the 11-year-old and fear from Bec! Granada, Spain with its UNESCO sites would be the venue for our first Segway experience and I couldn’t wait. We were looking for fun things to do in Granada, and hopefully, segway would be it. Ensegway of Granada were hosting us on this memorable experience. What was more amazing was that they were able to accommodate our 8-year-old on a Segway. We knew that Willow at 11 would be fine but we were not sure with Marley at 8. We assembled at their office in the Old Town area of Granada at 4.30pm. We were joined by 3 others and our instructors Marc and Gus. Marc and Gus were amazingly welcoming. They assured us that the youngest member of our family would be fine. Marley would be assisted by Gus throughout the ride which put Bec at ease. They guys showed us a map of the sights of Granada Spain. We chatted about several routes we could take on the Segway There were three tour areas that we could go on and as there was another family on the tour we all discussed the best option for seeing Granada Spain points of interest. It turned out we had all actually been to the Alhambra that day so we chose the tour that took us up to a lookout where we could take pictures and see the Moorish area of Granada. Where do we stay in Granada? We stayed at Hotel Atenas on Gran Via, This hotel features a 24-hour reception, luggage storage and more. We stayed in a comfortable family room. Hotel Atenas is located on the edge of the old town with close proximity to restaurants and attractions. There are some great places to eat in the near vicinity. The Granada Cathedral is only 150 meters away. Look at and book at Hotel Atenas HERE. We moved out of the alleyway and made our way cautiously the first 100 meters into Plaza Nueva on our Segway tour in Granada. Gus was first with Marley right behind him, then Willow, Bec and myself. The other family followed us and Marc brought up the rear. Gus told us a short history of the plaza before we headed up the Sad Street. The Sad Street was named because of the Funeral processions that used to pass along here on the way to the cemetery near the Alhambra. We stopped at another little square. This is where Gus broke out the dance moves. Being in Flamenco country it was only right that Gus would break a flamenco dance on the Segway. This gave us all a really good laugh and we all had to have a try! The Alhambra and the Nasrid Palace loomed large on the hill behind us as Gus entertained us. 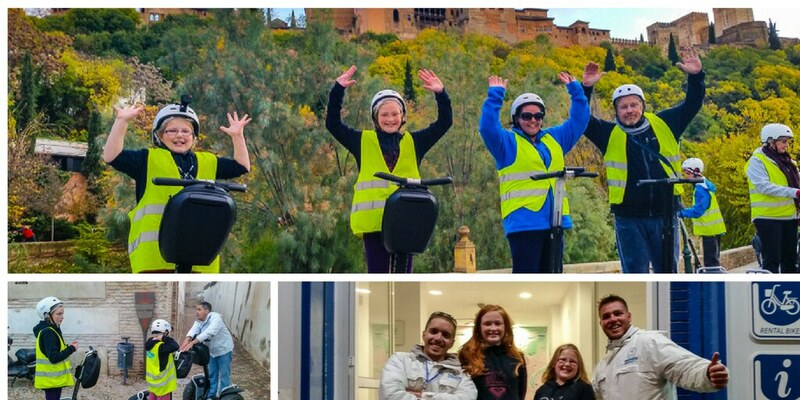 Hands up who had fun on a Segway tour in Granada? From here we headed up the hill to the old Moorish area of Granada. An area that itself is a UNESCO World Heritage Site. By this stage, we had mostly got the hang of the Segway. Lean forward to move and go fast or lean back to slow down. Marley had not quite got her confidence yet so Gus assisted Marley by having one hand on her Segway and one hand on his as we zipped up the hill. We made our way through alleys and streets while the guys explained the facts and the best things to do in Granada in this area. We all loved listening to their stories of the places we were going through. Both Marc and Gus kept us entertained with the history and the kids as well. If you’re looking to see the sights in Granada Spain climb aboard a unique city train in Granada. Discover the city centre and places to visit in Granada Spain at your own pace. Hop on at any of the stops along 2 routes, and enjoy panoramic sights of Granada from the specially designed train as it winds through the narrow streets. For more information and booking click HERE. After navigating through some very tiny little streets, we got to Mirador de San Nicolas Wow and double wow! From this point above Granada, you can look straight across at the Alhambra, Nasrid Palace and Generalife Gardens. The Sierra Nevada mountain range that runs through Andalusia made an amazing backdrop. This view has appeared in many pictures you will see of the Alhambra. We tried to take the view in and get some quick family photos while Marc and Gus looked after the Segways. It was fantastic to be able to take a few minutes to enjoy the atmosphere up there with music playing and street performers too. Back on the Segway, we started to make our way back down the hills to the commercial area of Granada. It was hard to concentrate with amazing views of Granada right at your eye level around every turn. The whole Segway experience was amazing for our whole family. We are already planning another Segway tour when we get back to Australia, we enjoyed it that much. 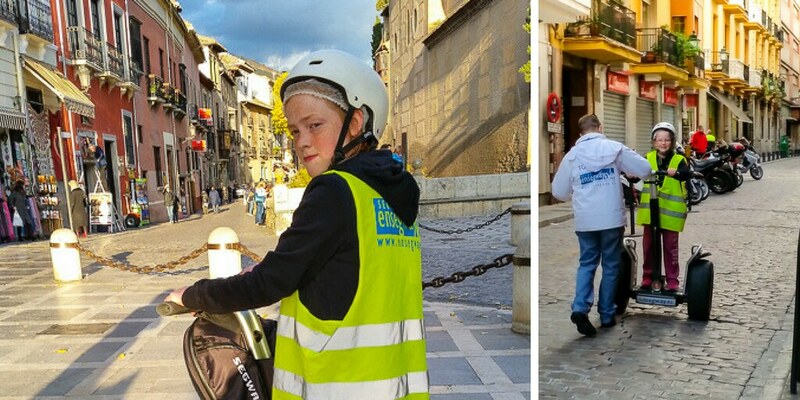 If you are looking for things to do in Granada We highly recommend Ensegway when in Granada. Gus and Marc were amazing hosts and they made the experience so much better for us all. They were really good with the girls and so patient. Both were worried that they would crash or get hurt and within minutes of the tour starting you knew that you were in safe hands with these guys! 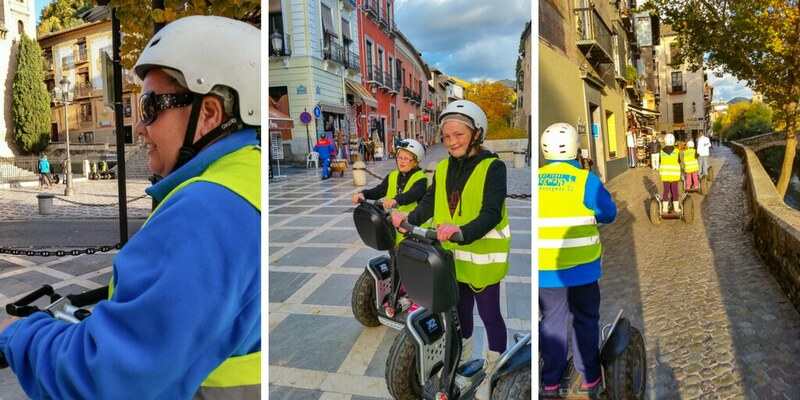 Segway was one of the many fun things to do in Granada on a budget. Granada has so much going for it, there are some many things to do in Granada Spain. We hope you liked this post about our time in Granada. Here we have 2 more posts from our amazing stay in the city that we hope will help you love Granada as much as we did! I have always wanted to do a Segway Tour! Grenada looks like a great little town to do it too! So great that every gained confidence, in the end, to go a little faster and props to the company for having GoPro mounts on the helmets!! We’ve never ridden a segway but it sounds like a lof of fun their in Granada. Gkad you all got to enjoy it. Oh wow, you guys really took to the experience. Proud of Bec for giving it her all! I did segwaying too in Madrid and was quite nervous, but it feels amazing once you’re on. You’re right that it’s the instructors who really make you feel safe. Our instructors at EnSegway were amazing with our kids. We were all flying along in no time. I never used a Segway. It looks fun and sounds like a great way to explore a city! I am looking forward to see some pictures of your Segway experience back in Australia. We did a segway tour once but this one looks way cooler. I’ll have to check it out when if our travels take us to Granada. Mindi your travels definitely should take you to Granada best tapas in the world and complimentary with drinks. The first time I used Segway , was in Spain. And I fell twice! Now I am an expert. Didn’t know it is safe for children as well. Awe, I love seeing companies and guides that are great with kids! It really changes the whole experience. I am glad that Bec mustered the strength to go and it looks like the kids totally rocked it! Sometimes I think it’s the kids we need to worry about less, they always seem so capable. Looks like a great family adventure through some amazing sites! Have fun! I’ve never been on a segway, but I feel like I probably wouldn’t be very good at it. Your kids would be doing laps around me! Seems like a great way to get around though. I always love seeing what adventures you get into with your kiddos! It looks like such fun! I loved Granada and hope to return someday. Maybe I’ll do one of those Segway tours. .. Sounds great fun. 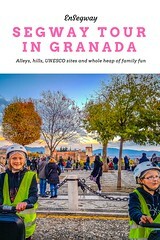 We haven’t been to Granada since before we had kids – they’d love seeing it like this! How cute were your kids! I loved the commentary. Such a good location for your first segway tour too. Jane, Granada is amazing have you been before? I didn’t do the segway tour in Granada, but I did enjoy touring Granada, the Albacin and the Alhambra. Its a beautiful city with great food, friendly people, amazing weather and the food and tapas and flamenco… can’t say enough the region of Andalucia… it’ say favorite region in Europe.